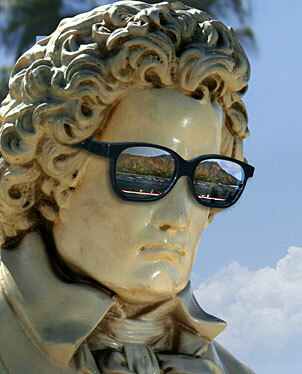 Beethoven may have rolled over to tell Tchaikovsky the news, but Ludwig and his droogs are back in town in a big way. For the first time in years, the classical Masterworks season of the Honolulu Symphony Orchestra will likely give the crowd-pleaser Pops side a run for its money. And no composer gives a symphony a workout like Beethoven. » Halekulani Masterworks: Tickets are $19 to $70; season tickets start at $104. » Toyota Pops: Tickets are $20 to $82; season tickets start at $126. » Exceptions: The Beethoven Festival and Diana Krall's Pops concert are for sale only to season subscribers. HSO's primary conductors are out of town at the moment, but we got Matt Catingub and Andreas Delfs on the phone, as the new season for both begins in September and tickets to individual concerts go on sale Monday. "With Pops, every year you try to aim higher and go further," said Catingub, who is celebrating his 10th year as Pops conductor and arranger. "The people in charge have changed, but the Pops is successful as always." The consistent success of the Pops has spurred Masterworks principal conductor Delfs to raise the profile of the classical side. "We have a beautiful symphony, but it's been a little too quiet perhaps," said Delfs. And so he is bringing out the big guns. "With a new, full season, it's time to remember our roots, why we fell in love with classical music in the first place. Any list of top composers has Beethoven at the head." There's so much Beethoven this season that a "mini festival" has been constructed around the composer. There's no guesswork here: Delfs did something similar with the Milwaukee Symphony some years ago and it was a runaway hit. You can't argue with success, and you don't mess with Beethoven. "Everyone's familiar with Beethoven; he's what we come back to," Delfs said. Other classical heavies are weighing in as well. Brahms, Prokofiev, Wagner, Copland, Gershwin, Liszt, Grieg, Mussorgsky, Rachmaninoff, Strauss, Sibelius, Stravinsky, Tchaikovsky - it's the all-star Traveling Wilburys of orchestral composing. "We've constructed themes that are big showpieces - Stravinsky, Wagner, the sort of composers that have glory and sparkle and color. If you don't have goosebumps at the end of 'Firebird,' well, you're dead," Delfs said. "We want to remind people what is great about symphonic orchestras, what makes them special. A symphony is not an intimate chamber orchestra, it is large and majestic and powerful. My job is to remind (patrons) of the beauty and surprise of live orchestras. And my job as conductor is to have the orchestra play the piece as if they were playing it for the first time, and the music lifts you right out of your seat in joy. No been-there, done-that. Experience excitement - the roots of why we have orchestras in the first place." Will the Pops also stretch new symphonic muscle? Catingub isn't messing with past success. His season mixes the familiar, such as Peter Cetera and a Ray Charles tribute, with new artists such as Bela Fleck. "And everyone loves to hear Dave (Koz) and Diana (Krall)," he said. "And, hey, Willie K is headlining for the first time!"